Preparing a new garden bed can take several months, start right and your work will be much easier. In the small garden, simply pulling or digging weeds like thistle, buttercup and dandelions or persistent vines like ivy, blackberry and bindweed is effective, but time-consuming. Spot spraying with chemical weed killer or covering lush top growth with black plastic for a year have their merits - and their respective fan clubs and both should be considered in small urban gardens. Covering a potential planting bed with cardboard or black plastic to remove weeds and grass is Dianna's first choice for preparing a new garden spot. This area next to the foundation was overgrown and full of perennial weeds and large grass clumps that were hard to dig. One half of the space was spread with flattened cardboard boxes, overlapped slightly to keep perennial weeds from growing through cracks and covered with 3 inches of mulch. After two months and very heavy rainfall, the cardboard had completely composted and when the mulch was scraped away the soil was in good condition for planting, damp but nicely friable, which means it was "crumbly" in the hand. Low rainfall areas might take longer for the same results if started in fall when the weather has cooled, but you can brush away the mulch occasionally to check the progress and with a box cutter or serrated kitchen knife, make "planting holes" in the cardboard after several weeks if your plans need to progress faster. Despite the cold weather, the tough weed stems under the plastic had broken down into soft straw-like pieces when it was pulled away. 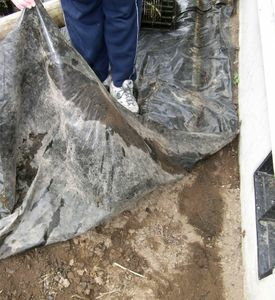 This same sheet of heavy duty black plastic has seen several seasons of use. It is not washed clean before storing away, but simply left on the lawn to dry, folded and put out of direct sunlight in a garden shed. Large-scale landscapes- chemical means are sometimes necessary, especially if this is a recovery process from years of neglect. Chemical weed control can be justified to restore a garden or create a new one if the space is quite large. Rural gardeners, with strong fences, can employ pigs to root or goats for the initial bush clearing and continual nipping back of the leaves; not so practical for those in cities or areas with restrictive covenants. Preparing soil is a longer process than most gardeners would prefer. Inspired by new designs and ready to immediately plant any open area that presents itself, the initial satisfaction is quickly replaced by the realization that there are many, many weed seeds and roots lurking just under the surface than first imagined. To start, first remove all large roots and fibrous top growth that you can find, add soil amendments if desired, then rotary till the soil and immediately water the area. At this time, you want to encourage any dormant weed seeds to "show their faces" and germinate. When the weeds and/or vines have begun to grow more than a few inches tall - definitely before going to seed - spray a weed killer recommended for your area and weed types. Either spray just after moderate rainfall or irrigate the area to wash dust off the leaves and apply weedkiller when the foliage is dry. If you spray "dusty" leaves, the chemical may not be effective. Resist the urge to disturb the soil when you first see signs of stress in the treated plants; more time is required to kill the roots. Wait at least two weeks before tilling the soil again, at which time, most weeds will have become brown and crispy. Your garden is now ready for your new plant treasures. Remember that you will have eliminated most of the weed roots with this process, but dormant seeds brought to the surface will still happily germinate. Consider using one or two inches of mulch in your completed landscape, promptly pulling any weeds that present themselves and do not disturb the soil surface any more than necessary to keep those sleeping weed seeds from germinating. Chemical weed killers are non-selective; that means that anything "green" will be severely damaged by the chemical, be very careful about drift if desirable plants are nearby, using either a spraying shield made from a cut down 2 liter soda bottle or a commercial attachment for your sprayer tip. As for personal safely, wear long sleeves and pants that are easily laundered, a separate washer load if possible. Wear disposable gloves, face mask, and spray on a calm day to be most accurate and do not allow animals into the area. Pre-emergent chemicals If you are tempted to use one of these chemical lured by the promise of weed-free gardens, be sure you read the application instructions fully. If "a little is good then lots will be better" should be your motto, you will cause severe damage to your planting area. If the instructions say "avoid overuse" and then do not go on to define "overuse", be cautious with it's use. Commercial growers who use chemicals for weed control usually also practice crop rotation so that chemicals do not build up in the soil. If they are not doing crop rotations, those we know, NEVER use these chemicals more than once every 2nd or 3rd year. You might consider these products for driveways or garden paths that will most likely never be used for planting. Be cautious about "run off" into storm drains or into a lower portion of your garden, we had a customer who literally killed an entire section of garden on the down slope side of their driveway. Landscape Weed Barriers: Dianna does not use the grey woven "landscape cloth" under mulch in the garden, even among shrubs in so-called "permanent" designs. Weed seeds still germinate within the mulch and anything that produces aggressive tap roots can penetrate the fabric, making the the stubborn weeds difficult to pull out. The fabric can be very hard to remove should your design change, especially if a previous homeowner used it and it is "buried" just under the surface of grass or weeds. It's best use is under concrete paving stones and crushed rock paths - there it shines and is a work-saver.